Avengers: EndGame's marketing is getting stronger by the day, though, the makers are making sure that they don't reveal too much. We have three trailers and a few TV spots, filled with Easter eggs and character reference, and yet not a single promo gives us a clue of how the surviving Avengers will undo Thanos' snap from Avengers: Infinity War, and bring back the dead superheroes. Forget that, even the baddie, Thanos, or rather his hand, is offered as a mere glimpse in all the three trailers combined. Avengers: Endgame's New Trailer Clocks 268 Million Views In Its First 24 Hrs But Fails To Beat The Record Set By Its First Teaser Trailer! Now, Marvel has released a new official synopsis on their official website that gives the fans what to expect from the film. The plotline reads, "The grave course of events set in motion by Thanos that wiped out half the universe and fractured the Avengers ranks compels the remaining Avengers to take one final stand in Marvel Studios' grand conclusion to twenty-two films, Avengers: Endgame." The TV spot reminds the Marvel fans of how we lost so many superheroes thanks to the snap, like Black Panther, Guardians of the Galaxy (except for Rocket Raccoon), Falcon, Spider-Man, Doctor Strange, The Wasp, Bucky. And then it shows the surviving superheroes walking in their new suits towards what we can expect to be the machine that puts them in the Quantum Realm. Avengers: Endgame: Thanos New Look From The Film on a Leaked Magazine Cover Shows Him Armoured along With The Infinity Gauntlet- View Pic! 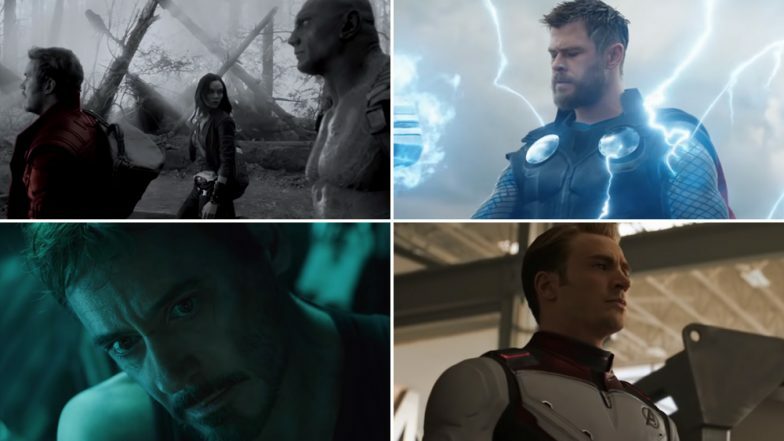 Avengers: EndGame, directed by Anthony and Joe Russo, marks the end of the journey for some of the popular actors in the Marvel Cinematic Universe. It is all set to release on April 26.